Plan Your Raid with RaidComp! MMO ChampionÃ¢â‚¬â„¢s released a great new tool for Guild and Raid Leaders alike! ItÃ¢â‚¬â„¢s called RaidComp! The basic premise of the tool is that it allows your leaders to plan raids and optimize them by literally dragging and dropping different class specs. 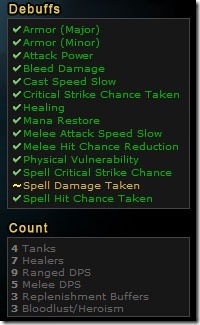 The right side of the screen shows buffs and debuff abilities that the spec can bring. 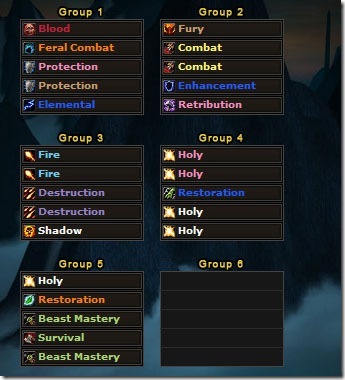 With buffs now being applied raid wide, it would be time consuming to manually figure out what spec your players were and what abilities they had on your own. Using RaidComp, you donÃ¢â‚¬â„¢t have to do that anymore. Right: Here you can it showing the debuffs that the raid composition I picked will be able to apply. Below the debuffs, you can see the total count of the number of tanks (based on talents), healers, Ranged DPS, Melee DPS, Mana Batteries (Replenishment), as well as Heroisms. There are certain classes and specs that will overlap with each other. YouÃ¢â‚¬â„¢ll notice that Spell Damage Taken debuff is in yellow. I have a Warlock in there with Curse of Elements which increases the Spell Damage taken. There is a talent that increases the potency of Curse of Elements to 13% (Spell damage taken increase). Alternatively, if I didnÃ¢â‚¬â„¢t want the Warlock to pick up that spec or if they didnÃ¢â‚¬â„¢t want to get the talents for whatever reason, I can mouse over that and it will show me the other classes and spells that can do the same thing I want. You can see what it looks like below. Below: And just for fun, hereÃ¢â‚¬â„¢s a test raid that I threw together just for kicks to ensure that I could get every possible buff and debuff so you can see what it looks like. It offers full support for a 40 man raid. Not only that, you can even export builds as links and share them with other players. A great big thanks to the tech monkeys at MMO-Champion for coming up with this nifty script!